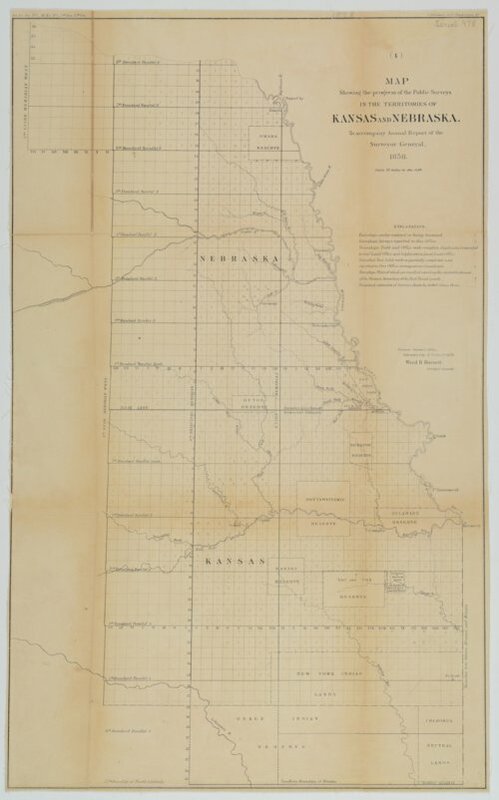 A sectional map of eastern portions of Kansas Territory and Nebraska Territory. The map shows the progress of public surveying of lands. This map accompanied the 1858 Annual Report of the Surveyor General, Ward B. Burnett. Rivers and Indian reservations are also identified on the map. This map is provided through a co-operative project between the Lecompton Historical Society and the Kansas Historical Society. Partial funding was provided by the Ross and Margaret Wulfkuhle Charitable Trust and the Freedom's Frontier National Heritage Area. Copies of this map are available for viewing at both the Kansas Historical Society and Lecompton Historical Society.